last night i finally managed to get my ibook to play movies from my external dvd burner (my early edition white ibook only has a cd-rom drive). i had to use the pacifist to pull the dvd playback package from the system discs. apple, blinded by marketing strategy, doesn't make it easy for those looking to think outside its corporate box. nevertheless, it works, and now i can watch dvd's on my ibook, i just have to bring the external dvd-rom as well. it was almost 5am when i finally went to bed. i got up at 9am, worked on my freelance a bit (not to mention cleaning my bedroom slash home office, it was so cluttered i couldn't perform correctly). when i got tired or needed a break, i'd go lie on the bed, or maybe go into the backyard and water some plants. today i brought all the plants down from the porch seat (now i can sit down again!). my tomato plants have finally started to flower. 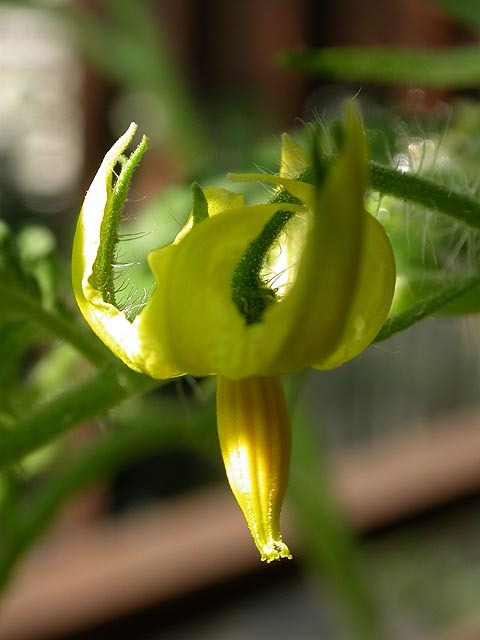 tomatoes are related to poisonous nightshade, and you can really see the similarity in the shape of the flowers. 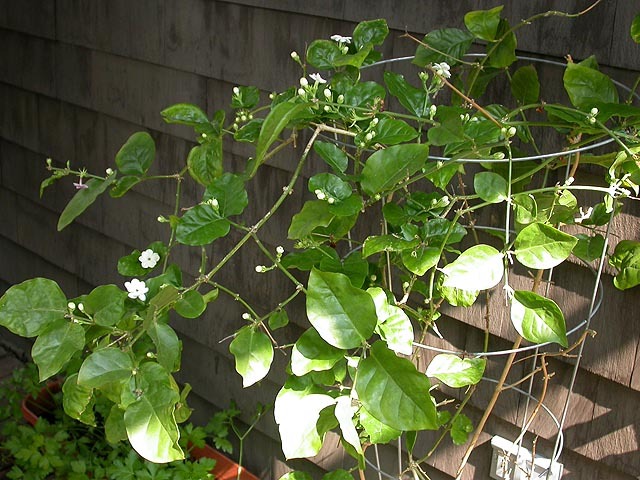 my jasmine is doing better, flowering profusely, but hardly making any new leaves. i left the house at 12:30, heading into boston to meet up with james and kristine for lunch (they gave me some crap about not being in the office to help them clean up). anyone who's ever been to the porter square T stop knows that going down that very long escalator can feel like a trip to hell, so deep underground. up above are hanging billboards with pictures of old trains decorated with numbers. in case you needed further proof as to your true destination, the number "999" can be clearly seen on at least two trains. everyone knows that's just satan's calling card turned upside down. 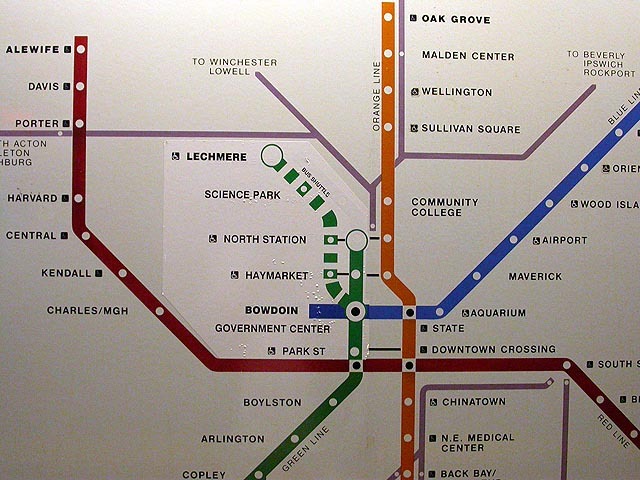 arriving at the platform, i noticed they had already changed the MBTA map. whether it's temporary and just for the DNC next week i don't know, but parts of the green line is now serviced by shuttle bus. 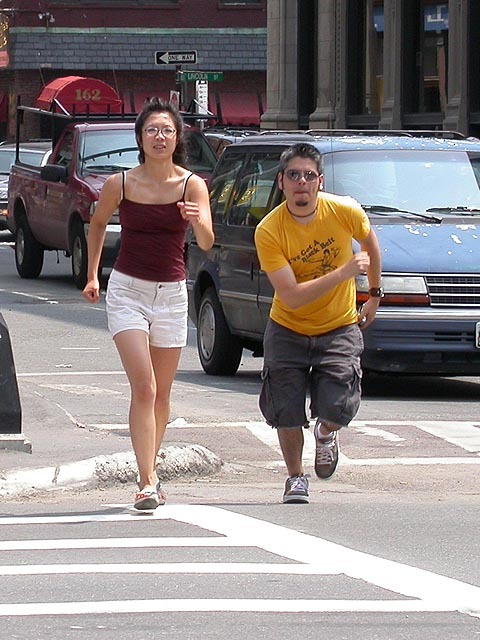 when i got into boston i gave james a call and met them at the chinatown gate. 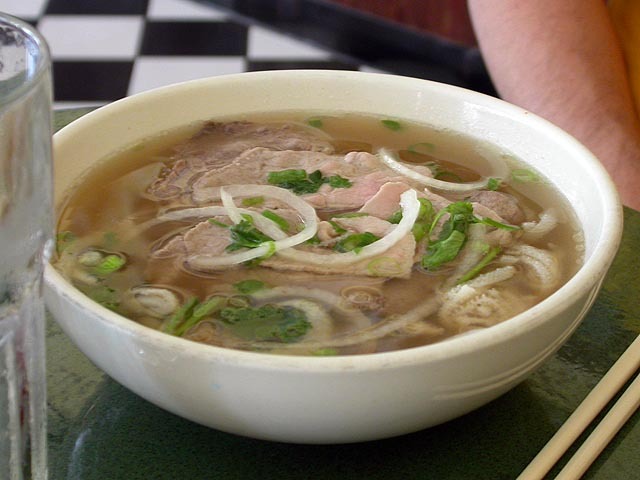 we decided to go get some pho, and went to the vietnamese restaurant on the street corner next to the fabric store across the street from the new england medical center. kristine told us about her trip to portland, oregon this past weekend to attend a web designers conference, and surprised us with some startling news. 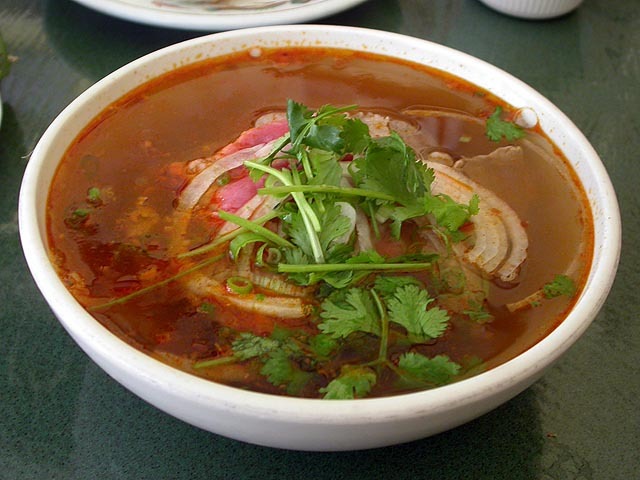 despite the 80+ warm weather outside, i went with a spicy pho (never had that before). 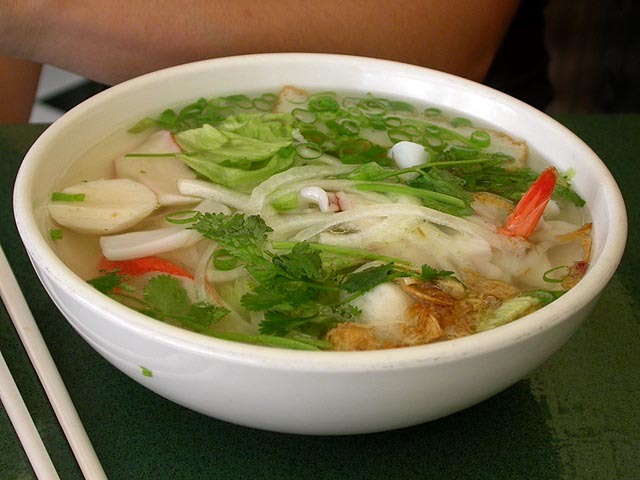 kristine had a seafood pho while james had the plain pho with some tripe. they seemed to be fascinated by the fact that i couldn't swim, and wanted to teach me. they also listened with apt attention as i described how unemployment benefits work, the biweekly postcards, the randomly selected mandatory career service meeting you might have to attend, etc. 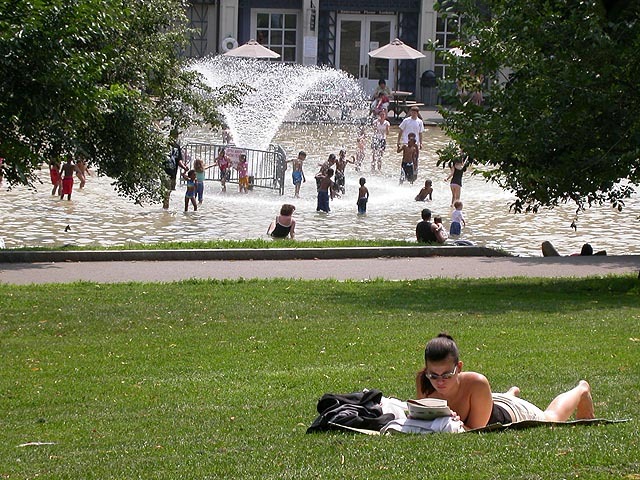 afterwards, though originally we thought about getting ice cream, we were too full, and while they went back to the office, i went to boston common and a bit of the charles river to look for photo ops. while wandering around, on a street corner a block away from the cheers bar, i saw a television crew interviewing a man in a hard hat, perhaps a construction worker, or maybe an engineer. i didn't pay very much attention, but when i turned back to see who was doing the interview, i realized it's rob corddry (! ), from the daily show, here in boston doing some DNC coverage. corddry seemed to be asking the man about the big dig, and at one point he was poking himself and saying, "does it hurt here? or here?" i wasn't the only one who recognized him, there were a few other passerbys who smiled when they realized who it was and shook their heads. in the rush of excitement, i called up julie afterwards to tell her about my "celebrity" sighting. i finally came back to cambridge around 4pm. my day wasn't over yet though, i quickly got changed and went out running, didn't even bother wearing a t-shirt because i knew it'd just get soaked and i'd eventually take it off anyway (bruce whistled from his window as i ran by). it was so hot, i could feel the blood throbbing inside my veins. i ran with this look on my face like i was in horrible constant pain. my arms were probably flailing, my head thrown back, my lips dried. over the eliot bridge, by the boat house parking lot, i was so happy to see they finally re-installed the drinking fountain. i stood there gulp down lukewarm water, soaking my head underneath the sparkling parabola of soothing wetness, suddenly startled by a sweaty man with a moustache standing next to me, waiting to use the fountain. after a hot shower, i went back to freelance for a few more hours, trying to get a groove with the coding. around 7pm i stopped so i could watch the red sox game, they ended up losing to the orioles behind pedro's pitching. i had some more of my leftover cold peanut noodles (i love the fact that it's served cold, nothing to heat, straight from the fridge, easiest preparation time ever). later, i watched some reno 911.